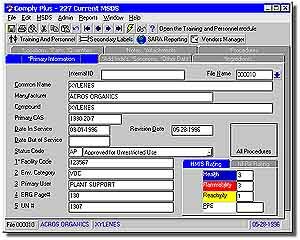 Comply Plus Web is a fully customizable, Intranet browser-based database for managing and distributing Material Safety Data Sheets (MSDS). This new product, which provides MSDS in either text or image format, gives employees direct access to all the MSDS used at their work site through a PC Web browser. It is designed to relieve the administrative burden of organizing and distributing MSDS in accordance with employee right-to-know laws. Using this database, employees can retrieve MSDS and related information 24 hr. a day from any PC with Intranet or Internet access. They can search for a particular MSDS by manufacturer name, product name/synonym or work site. The search screens are fully customizable, depending on a company's needs. Another benefit is the ability to attach supporting documents, such as company policies or safety notes, and helpful Internet links to each MSDS. According to the manufacturer, this product also reduces the possibility that multiple users working simultaneously will be unable to retrieve the same MSDS. Dolphin Software, Inc., 9 Monroe Parkway, Suite 150, Lake Oswego, OR 97035. Tel: 800-275-6737; Fax: 503-635-3824.